Taylor Mikesell unleashes a three-point shot. Photo courtesy of Maryland Athletics. 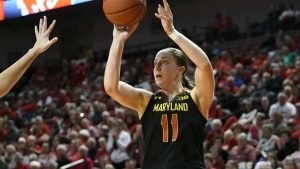 As Maryland guard Taylor Mikesell has shown on the court so far this season, she is not an average college freshman. Yet, off of the hardwood, Mikesell does share one thing with seemingly every other young student. “Anytime somebody asks about food, she’s like, ‘Chipotle?’” freshman forward Shakira Austin said of her teammate, with a laugh. When it comes to basketball for the powerhouse Terps, however, Mikesell stands alone. She is one of only three freshmen in the nation consistently starting for a top 10 team, and she is on pace to lead the team in minutes played. 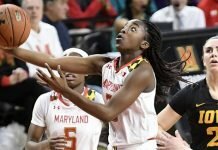 This would make her the third Maryland freshman over the last ten years to be in that position. But despite her growing responsibilities, Mikesell isn’t the Terp’s statistical leader. Junior Kaila Charles, a unanimous preseason All-Big Ten First Team selection has that distinction. Nor is Mikesell the guard with most college accolades; that would be sophomore Channise Lewis, named to the preseason Lieberman Award Watch List for best point guards. Mikesell isn’t even the biggest star freshman on the team, as Shakira Austin, who has been named Big Ten Freshman of the Week five times already, seems to live in the spotlight. Mikesell leads the team in minutes played because of her ferocious work ethic, her superior shooting skills and her high basketball IQ, according to her coaches and teammates. Mikesell, a top 50 recruit, came in over the summer and immediately began creating the legend of her shooting routine. Every off day she makes at least 1,000 shots (450 two-pointers, 400 three-pointers and 150 free throws) while on game days the number simply becomes 500 makes. Frese said her trust in Mikesell comes back to that work ethic. Austin said her teammate’s energy inspires her. In addition to her work motor, Mikesell is efficient. As of yesterday, she is 24th in the nation in three-pointers made and ranks in the top 30 in three point percentage. “You’ve got to be able to put the ball in the basket, and she does that at a really high rate,” Frese said. Junior forward Stephanie Jones said what separates Mikesell from other freshman is her ability to score in a variety of ways. 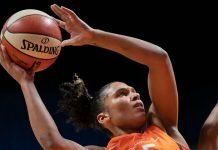 “She can shoot off the dribble, behind screens, off screens, whether it’s a set shot, it doesn’t matter; she can score anywhere on the floor,” Jones said. Mikesell’s prowess from deep has helped her passing as well, as teams have to step out on her, helping space the court and giving post players like Austin and Jones more area to work with. Her 14.6 points and 3.5 assists per game are both second on the team. 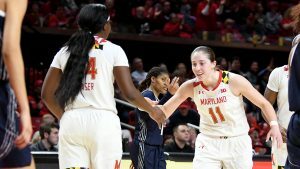 Frese said Mikesell’s three-point acumen is reminiscent of former Maryland great Kristi Toliver, who helped the Terps win a National Championship and went on to do the same with the WNBA’s Los Angeles Sparks. Toliver still holds the Maryland record for treys made in a season and a career – records Mikesell could challenge. Taylor Mikesell is introduced before a game. Photo courtesy of Maryland Athletics. The freshman is averaging about three made three pointers a game, and with seven games left in the regular season, she has hit 67. If Mikesell continues at her current rate, she will finish at around 88, three short of Toliver’s record of 91. The Terps will then get at least one game in the Big Ten Tournament and, most likely, the NCAA Tournament, giving Mikesell two more games to break the school record in her first season. While Mikesell’s scoring fills up stat sheets, her ability to understand the mental aspects of the game are perhaps more subtle, but just as important. Frese said their study sessions have quickly evolved. Mikesell’s ability to improve has given Frese plenty to challenge. Though Frese has come to rely on Mikesell more as the season has progressed, she does not seem any worse for the minutes she is logging. Austin, who has her own freshman wall to avoid, has no worries about Mikesell. While not expecting to see as much floor time as she has, Mikesell said she is focused on contributing. 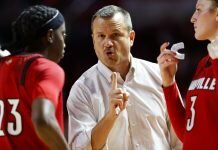 Frese said she would like to lower Mikesell’s minutes, but not at the expense of the team. Frese said she watches Mikesell for signs of fatigue, but sees none. Yet for all the praise, Mikesell has won Big Ten Freshman of the Week only once this year. She’s still in the shadows of Charles and Austin – not that she cares. The spotlight doesn’t get her in the gym, yet it seems getting in the gym may eventually bring her into the spotlight.